Due to very serious health concerns, I have moved to Hawaii, hoping for some magic healing and wellness, and if not, at least I spend the last of my life in Paradise. We have a flock of Tennessee Fainting goats (about 16), a flock of tame and lovely Toulouse Geese, a dozen Muscovy ducks, my precious Icelandic chickens, and two guard dogs who will be looking for new homes. Here are photo albums for each group: Toulouse Geese, Buffy, my Great Pyrenees guardian dog, Angel, my Anatolian Shepherd guardian dog, my Muscovy ducks, my Tennessee Fainting Goats. 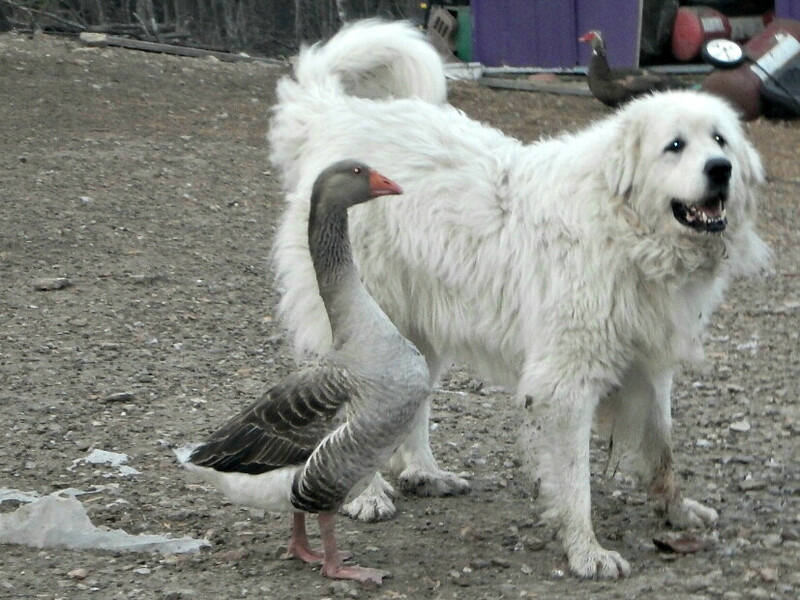 I would love for Buffy my 7 year old Great Pyrenees to go with the geese and/or the goats. She is quite bonded to them, and them to her. All of them respect electric fence, and I’d love my geese to have pasture and a pond. Buffy is a pretty chill girl. She barks at night, but not obsessively. If she can’t go with Angel, she’d be great to pair up with a young puppy and let her teach it how to guard like she did with Angel. 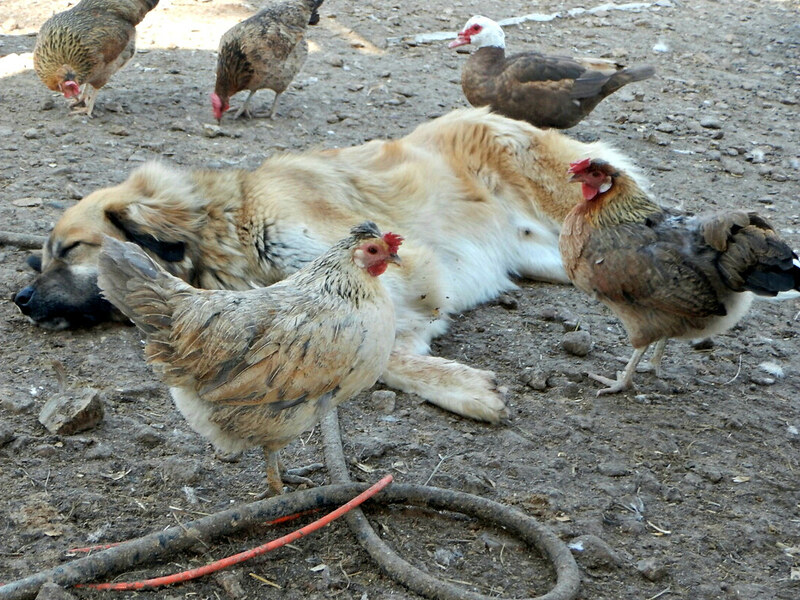 I don’t mind selling either the goats or ducks separately, but will definitely give preference to those with ponds, pasture and guardian dogs. We’ve been raising Icelandic Chickens for ten years now. I would love to sell the flock as a whole, and find someone who wants to continue my preservation efforts. I will definitely give preference to someone who has no other breeds of chicken on the property. Angel, my year old Anatolian Shepherd guardian dog would be a good idea. He is quite bonded to them. He is great with electric fence, and a big lovely boy, 18 months old, and been with my critters since he was 8 weeks old. If you are interested in some of our animals, please write to me with an offer at lisa.richards@gmail.com and we’ll discuss. I am hoping to make enough money to bring my dogs to Hawaii, so even if you aren’t interested yourself, perhaps share this with someone you know you might be. We are located about 20 minutes from Branson, Missouri. The home number is 417-334-3143 if you’d like to talk to Frank about it. We lost our Great Pyr to cancer in January and I would love another. We would consider a geese flock! If you still need a home for a LGD, I would love to talk to you. We have a nine acres hobby farm, horse, chickens and turkeys. House dogs. I am a freelance writer and work from home. I am sorry you are so sick. Are you selling your homestead too? We are interested in moving to Missouri. If I had a reliable vehicle I would take the whole lot of animals. But I live several hours away. I would be interested in the chickens, goats, Angel and Buffy. I would be interested in Buffy. I have 17 goats, 20 alpaca, and 65 llamas in Northern Michigan. I do have a border mix who will be one in June named Moose. He really wants to herd, but doesn’t have it down quite right LOL My husband will be picking up my daughter on June 8th at Ft Leonard Wood. He could meet you on his way home. I’m interested in the ducks, geese and dog. We have 80 acres and are still developing the land. Let me know if they are still available. Youre leaving your farm and animals to move to Hawaii. Excuse me if I find this rather suspicious. I have worked in the medical field…never heard that Hawaii heals. Anyway ….I live near Iron River WI on a farm. Need help let me know. So what do you know about an inoperable brain tumor, where chemo, radiation and surgery aren’t options? You’ve worked in the medical field and obviously know everything. I don’t know much but this I know! God Bless you, get many opinions, call St Judes Childrens Research hospital ( yes they work with adults) and live life to the fullest ! I was thinking about you today so decided to pull up the MackHill Farm facebook page and found your blog post. I’m sorry to hear about your health issues, and about Buffy. Know that you and Frank are in my prayers! So sorry to hear about your health issues. I spoke to Frank earlier today. We would interested in the does, doelings, & buckling with Buffy. Also would be interested in the ducks and maybe the geese. Wishing you the very best, sure it’s​ very hard to leave such beautiful animals. Please call or email us. How many chickens are there? I haven’t had chickens since 2008 and am itching to have them again. Obviously, I do have all the equipment needed to raise and keep poultry. They will be Free Range and Cage free. The grandchildren are BEGGING for chickens. I am talking to my husband about it, but no answer as of yet. I just learned of you and your situation last evening. We also had Toulouse geese for the kids when they were young and in 4-H. I might be able to get a pair of them, but no more than 2. We live in NW St.Charles County – Between Troy and Wentzville. The grandchildren will be in 4-H and be taking the poultry project, so some of the birds would be shown at the County Fair. This is a breed I have never heard of before and I have been around poultry for over 60 years. Oh yes? What is the age range of your birds? Please know that you are in my prayers. It seems that your condition is very similar to my husbands only sister, so I do have some knowledge of what you must be going through. Best wishes to you. You can read about Icelandic chickens at the Livestock Breeds Conservancy, and at the Icelandic Chicken page on Facebook. Their Icelandic name means “settlement chickens”, and they have indeed been in Iceland since the original settlement 1100 years ago. Ours range in age from hatched overnight, to 5 or 6 years. The geese are all 3# except for one gosling. We have no swimming water here so a very poor hatch rate. Not ready for my chickens yet, just wanted to post encouragement and hope. I don’t know you, but my heart hurts for you and your husband. May you find health and peace in Hawaii. Are any of the goats still available? I’ve had Fainting Goats for 16 years, I’d love to take some of them.